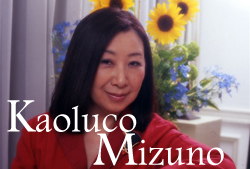 Kaoluco Mizuno, she is a jewelry designer who established KAOLUCO Collection. She received an international award for sixteen times. Her original design that tastes feminine and elegant is supported by women, and it fascinates them. She is the president of VIA KAOLUCO., LTD. doing creative activity mainly around Italy and Japan. The golden prize in Contemporary Jewelry Design Contest by sponsorship of the Mainichi News-papers. Designed for Tiffany, Ｃａｒｔｉｅｒ and Van Cleef & Arpels N.Y. ｂｙ request of U.S. City Gold. As one of 30 jewelry designs in the world in the 20th century, a work is purchased by De Beers of London and it is preserved permanently. Induction into the Hall of Fame of this gallery is achieved. The ring which modeled the Empress crown of the Ming Dynasty is created by request of Franklin Mint U.S. It is put on the market simultaneously in Japan and the U.S.
Participates in the "Gold in Fashion" exhibition held in Basel, New York, and Hawaii sponsored by World Gold Council (WGC) as Japanese designer representative. Established office　Via　KAOLUCO　in Tokyo, Japan. Chosen as the member of the designer's collection by De Beers. Held exhibition ”Infinito” at MISANI GIOIELLI in Milan, Italy. ”Private collection”' in Axis Gallery of Roppongi,Tokyo. Established office KAOLUCO in Milan, Italy. Member of judging committee for Creative jewelry Contest held by the Mainichi News-papers under the auspices of the Ministry of International Trade and Industry. Acts as the lecturer of the department of a jewelry design of art school 'Istituto Europeo di Design' of Milan. “Ｓｅｎｓａ　ｃｏｎｆｉｎｉ” is held by "NIMUS" in Milan, Italy, and private exhibition was held there every year until 1996. Leggenda' is held by Orsini Palace sponsored by committee of Viterbo Italy. Awarded Prince of Vicino Orsini medal. Produced　jewelry for Apostolic Nunciature(Vatican Embassy) in Japan.